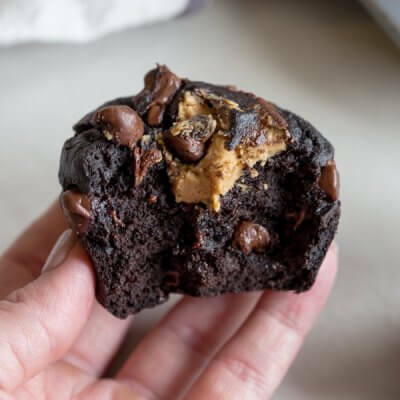 Chocolate chip muffins to the rescue— you’ve gotta try these no added sugar Healthy Chocolate Chip Banana Muffins. These easy Coconut Flour Banana Muffins are gluten free! Plus coconut flour recipes for keto, vegan, paleo, and mini muffins too! Preheat oven to 400 degree; coat muffin tin liberally with cooking spray. In large bowl, whisk together eggs, banana, avocado oil, and vanilla extract. Stir in cocoa powder until fully incorporated. Whisk in baking soda, salt, and almond milk and stir until fully combined. Stir in peanut powder and coconut flour. Fold in chocolate chips. Bake muffins for 15+ minutes until tops are set and toothpick inserted is crumbly not wet.